The Taj Mahal dates from the 17th century, as tomb for the favourite wife of Moghul-emperor Shah Jahan. She died at the birth of her 14th child in 1630. 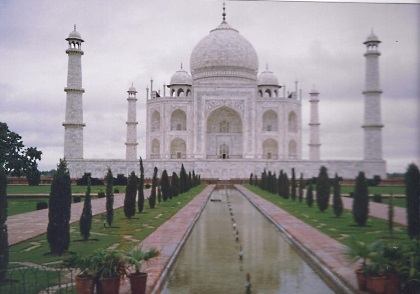 In grief, Shah Jahan decided to construct for her a monument to show his eternal love. It took 22 years to complete. 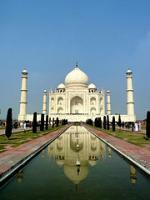 The name Taj Mahal is derived from her nick-name Mumtaz Mahal: pearl or crown of the palace. According to legend, Shah Jahan planned to erect a black version as tomb for himself on the other side of the river. A bridge should connect the two monuments. 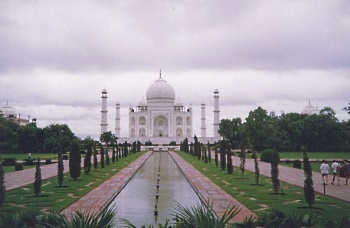 The Taj is situated in the city of Agra, on the banks of the Yamuna-river. It is enclosed in a garden amidst fountains and ornamental trees. The walled complex further includes two mosques and an imposing gateway. The writer Anthony Weller: "Several points about the Taj Mahal that astonished me: ... How big it is ... How clean it is ... How symmetrical it is ... How many of the visitors are Indians, not Westerners ... How as you get closer, you see there is curlicue writing all over it ... How much it matches all its photographs." What can I say more? Truly beautiful. When I visited India in January 2014 I figured a trip to the Taj Mahal was a must. I had seen so many pictures and I wanted to actually be there. So I booked a flight from Southern India (warm) to Jaipur (cold) and made my way east to Agra. The Taj looks great on post cards, but to me the details are lacking. The garden's aren't great, the surrounding buildings or the interiors neither. I have been to Cordoba and the Alhambra and those buildings are on a whole different artistic level. This is a site labelled a monument of love to the emperor's dead wife. To me, though, this felt like a monument to the greatness and power of the builder, not his deceased wife. The site did not invoke any sense of mourning about a lost one in me. Contrast that with Humayun's Tomb in Delhi where I really felt like a lost one was gone. As you may also read his wife died giving birth to the emperor's child. It was their 14th child! Having that many children would even be dangerous in today's times, let alone 17th century India. A loving husband could have considered some form of birth control. Sorry, that I don't find that very romantic. Agra was like the worst city I visited while in India. The river is basically toxic waste. The neighborhood run down... While this has little impact on the OUV, it doesn't improve the overall experience neither. A little later a friend of mine also went. Before going he asked me about it and I told him about my reservations. I also told him that I didn't wanna be the reason why he never went, so he should go. So he went. And he agreed with me. Going to Agra, though, was still a treat as I also visited Fatepur Sikri and Keoladeo National Parks, two sites I enjoyed greatly. Taj Mahal is really a very beautiful creature and it becomes even more beautiful just like heaven when you see it in full moon night. I have visited recently in january 2014 in full moon night and I have got really an Unique experience which I can not describe in words. I think everybody must see it in real and believe me its really a wonder of the earth. Calling this WHS a beauty is an understatement. I visited the Taj Mahal in December 2011 and spent 2-3 days exploring and taking in this wonder. The first morning rays of sunrise lifting the thick mist off the Taj Mahal is an unforgettable experience. The Taj appears before your eyes gradually almost as if it were floating in the air. A pair of Egyptian Vultures were soaring in the sky above the main white marble dome. The symmetry and architecture of the whole site is mind-bogging and it is so huge that it never seems to be overcrowded. Don't go there with an organised tour for a quick rush through the site. Take your time to admire one of the wonders of the world! A truly stunning experience. Walking through the gate building and there it presents itself in all its splendour and glory: the Taj Mahal. Not too crowded (may 2010). As a part of a trip to northern India, the golden triangle, this was the summit. I visited the Taj in 1987 but it doesn't really matter , does it? It's timeless. I was going to actually give the Taj a pass and skip it. After all, how many times has one seen the Taj in movies, images, brochures etc. Many times. But coincidentally, the train route i was taking from Calcutta to Bombay made a needed stop in Agra. I arrived pre dawn and had read in the guide book that the best time to view the Taj was at sunrise, sunset, or under the stars and moon. So by chance I had arrived at an opportune time. I hired a boy who pedalled a rickshaw but he went the wrong way! yep. I couldn't believe it. Eventually we got there and i was the first one in! It helps to get there early! I managed to get a photo with noone in the foreground. I was pleased with that. Part of the magic of seeing the Taj in person is the way the light of the sun and moon play off the marble. The mood of the Taj literally changes . It really is a remarkable experience. I also saw it in the early evening and the mood and sillouette of the Taj impressive. Best seen early or late to avoid the crowds. Some sites Machu Pichu, The Pyramids, Petra are hard to review because they are so icconic, that there seems to be nothing more one can add. The Taj Mahal is another such WHS, which like the afore mentioned places, really does take one's breath away; such is the power of it's radiant marble symetry. However it does not function just upon a grandiose scale, up close the exquisite workmanship stuns, the gardens are seductive, and the ancillery buildings shield you from what by comparrison is the vulgar and mundane of the outside world. I'm told the whole ensemble is supposed to be a relisation of heaven on earth. Did they succeed? Well if you can go and decide for yourself, it might just be the closest you get in this life to paradise. i've seen Taj Mahal when i was a kid in India when i lived there till i was 10 and moved to canada it was a the most beautiful monument i've evered seen as a kid. i love to go and visit again in my life time. At first light of dawn, when a cool breeze fills the air and the morning sun shines on the palace, Taj Mahal is at its height of beauty. Set against the azure skyline, it looks like a mirage in a desert - the greatest monument to love. It was exactly like this when, on an early December morning, I made my first visit to the legendary monument. It is certainly also true that it is a very special view to see the early morning sun rays embrace this absolutely magnificent white marbled tomb. who died at the age of 39 when delivering a child and the greif that then made the Shah immortalize their love by building the 'dream in marble' - 22 years in the making with the help of over 22.000 craftsmen. History tells that when Shah Jahan started to plan for his OWN mausoleum to be built in black marble across the river Yamuna, his son had just about enough of his fathers spending and locked him up in the Agra Fort. And there he sat until the day he died, gazing at the distant tomb of his long-lost wife. Almost makes you want to shed a tear, right..? The terrible thing is that admist dust and poverty, you enter a gate, and here stands a creation of love. Kipling said it was the 'Gateway through which all dreams must pass'. Tagore said that is was 'A tear on the face of Eternity'. Those descriptions sum this wonderful place up better than anything I could say. It's just a shame about the entry fees. my husband proposed to me whilst we were visiting the taj mahal, it is truly spiritual and amazing. you have to go to see it to get the true feel of the place. The Taj Mahal is not a site... It is a LIFETIME EXPERIENCE. No matter how many times you see it in pictures & all the rationalising about how it does really look like the pictures (of course it will!!) the sheer geometry and scale of "the real thing" is something that just has to be EXPERIENCED!! What is avoidable is the city of AGRA... & the people there.. especially thos hovering around the fringes of the Tourism industry. The filth of the city & sheer rapacity of it's denizens is unbelievable. There are many parts of the world where tourists are conned & cheated but AGRA (actually starting in from Delhi) is really BAD!! The basic civic amenities & the local government are non-existent. So outside the cocoon of the 5 Star luxury tours get ready for the rough & tumble of a real mean town. Avoid TOUTS like the plague. Even if a price seems cheap quote just 30%.. etc. The Govt. is also in on the racket charging absurdly high fees at all points without providing any facilities or security. If your looking for a basic feature like a clewan usable loo... then forget it.. Just admire the beauty of the TAJ. I feel WORLD HERITAGE STATUS should be decide only after subjecting the environs & infrastructure to the STRICTEST POSSIBLE scrutiny. Even things like local political factors should be factored in... reward progressive & proactive states & & penalise others strictly.. But the TAJ is still the TAJ!!!!!!!!!!!!!! don't miss it. What can you say about the Taj Mahal? It is certainly an emptional experience to stand in the shaddow (or shade!!) of such a magnificent work of art. People decribe it as a once in a lifetime experience to go there, now let me tell a secret, I have been there every year for the last 5 years. India and its people are the warmest and most welcoming. Forget the expensive package deal, if you know what you are doing you can go there for near enough the same price as going to Spain. My wife and I have been driven by private taxi from one side of India to the other, now that is an experience. How do you do it? You can fly to Bombay(Mumbai) for around £350 per person return for flight only. Searching the internet for hotels is ideal. You can get good quality air conditioned rooms or suits from about £10 per room per night up to about £25. You can go into the luxurious 5* places for anything up to £150 per room per night. Usually in the big Cities you want to be looking at about £20. If you get a map of India from any good book store, you can plan your own route. As a rough guide, 12 hours travel in a private taxi cost about £20 - £25. The hotel you stay in will get you a good driver who speaks english and who knows the area that you wish to go on your first leg. Take a leisurely drive and soak in the countryside towns and villages on your way. You will no doubt see weddings in villages, don't be afraid to stop and join in. If you feel like making a small gift of 200 indian rupees (about £3) to the bride and groom, do so. You will be invited to join in and eat with them. An excellent experience. When you start to become tired, simply ask your driver to find you a good hotel for the night. You have two choices then, you can send your driver back to Bombay and get your next driver from this hotel and so on. While you are on the road, you will want to stop off for something to eat. The driver will take you to a good clean place that he will know. His reward by the owners for taking you to his restaurant will be free food and drink for the driver. You can do this all the way accross India at your own leisure. If you find a particularly interesting place you can stay as long as you wish. You could simply tell the driver that you wish to drive for 6 hours with a one hour meal break in between and then stay at the nearest available hotel at the end of the 6 hours. You are paying so you do and go exactly where you want to go. This is what makes this way an exciting and enjoyable way. It is far better than a package where you have to be back at your hotel at 6 for tean and up at 7am to go on an excursion. Your whole holiday is one big excursion and you will see far more of the country and its friendly people. In the past, I have organised all my holiday via the internet. From being met at the airport by a driver holding a card with my family name on it to take us to our first hotel. Booked flights, trains everything. A 12 hour train journey in a 1st class air conditioned sleeper cost me £21 per person the last time I went in December 2001. We woke up nice and fresh having spent the night betewwn two clean, crisp white cotton sheets and nearly at our destination. You do not have to have a lot of money, most places take major credit cards and HSBC even have cash machines throughout India. The average cost of a good meal is from 50p to £1.50 per dish and I have seen 4 people eat one dish between them. I usually take about £2,000 with me (for 2 of us)and bring half of it back. It will work out about the same with 4 persons bacause the taxi is paid for if there is only 1 person or 4, it is the same. The hotels are by the room with an add on of about £2-£3 per extra bed per night. In India things are very cheap, an average factory worker working 12 hours per day 6 days per week brings home about £10 per week in wages. You are expected to haggle, if you go to a hotel and they say they want 1500 Indian Rupees a night for the room, tell them you will pay them 1200 rupees, they will either accept it or say you can have it for 1300. If they don't cut the price do not be scared to pick up your suitcases and start to walk out, they will call you back because 1200 rupees of yours are better than none. They know that if you go to the hotel next door, they would give you the room for 1200 rupees and they need the business. It's just the same when shopping, haggle. I usually find that whatever I buy, I get 2 for the original price of 1. They expect you to haggle. I look at it as though everyone in India is out to rip me off and I expect them to try. By haggleing, they are happy because they still manage to rip me off but I am also happy because they could have ripped me off for more. I hope that someone finds this feedback interesting and useful and wish that I had been given the benefits of someone elses experiences before I went the first time. India is a big and beautiful country, go out there and enjoy yourself. In 5 years I have never ever had an upset stomach and if you do not take any notice of what else I've said, please take notice of this.ONLY DRINK BOTTLED WATER THAT COMES TO YOU WITH THE SEAL INTACT. NEVER EVER DRING LOCAL OR TAP WATER. ONLY EAT FOOD THAT YOU SEE COOKED IN FRONT OF YOU. NEVER EVER EAT ANY FOOD THAT IS PRE-COOKED AND DISPLAYED IN GLASS CASES. Chahar Bagh Gardens: "The garden that beautifies Taj comes from the Persian Timurid style of gardens, and is based on the concept of paradise garden' and was brought in by Babur. This garden, filled with flowers, fruits, birds, leaves, symmetry, and delicacy, served many functions along with portraying strong symbolic or abstract meanings about paradise. A paradise which, according to Islamic beliefs, consists of four rivers: one of water, one of milk, one of honey, and one of wine." Thomas Cook Round the World tour 1872-1873: c Feb 1873 "...where the celebrated Taj mausoleum stands prominent among all the monumental edifices in the world"
Shah Jahan: Built as a tomb for his beloved wife, Empress Mumtaz Mahal. Works by Nobel Prize winning authors: Rabindranath Tagore (1913) - "Shah Jahan"
325 Community Members have visited.